It’s time to wave goodbye to warm champagne, to say farewell to lukewarm wine, and to offer a decisive sayonara to bad design. Why? Because Avanti’s Champagne and Punch Bowl is going to rock your world! This beautiful Champagne and Punch Bowl is sure to be absolutely irreplaceable in your home. 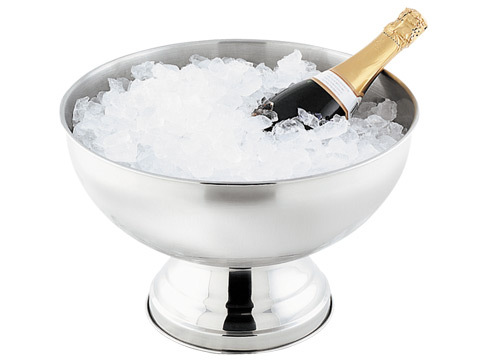 Made from high-quality 18/10 stainless steel with a stylish brushed satin finish, the large bowl is perfectly sized for holding your favourite bottles of wine and champagne, surrounded by crushed ice. Whether it’s something you just bought from your local, or a beautiful wine that has matured to perfection over the last two years, it’s sure to taste great! Or if punch is more your style, then this bowl makes a perfect serving dish for alcoholic or virgin cocktail mixes. You can even use it as a big serving dish at your next barbecue or office farewell party – cause everyone loves those! You know how every so often you find something in life that you just can’t live without (and try as you may, you realise you just won’t ever find anything quite like it again)? Well, this is it! Made from 18/10 stainless steel with a stylish brushed finish. Deep bowl has plenty of space for a few bottles of wine, plus ice! Also great for serving punch or holding party food. Features an elegant pedestal style base.